LOS ANGELES, Oct. 18, 2017 — (PRNewswire) — As a result of sold-out auditoriums and overwhelming demand, audiences will get the chance to experience " MULLY" for a special one-night encore presentation on Thursday, November 9, 2017 at 7 p.m. local time. Over the course of three consecutive screening dates, the award-winning film consistently drew in a stronger, larger audience performing 4th at the box office out of all releases and was the #1 attended film per-screen on the final day of its debut showings, October 5. Audiences now have another chance to see this event on the big screen. What happens when a six-year-old boy is abandoned by his family and left to raise himself on the streets? "MULLY" is no ordinary rags-to-riches tale. It's the true story of Dr. Charles Mully, whose unlikely stratospheric rise to wealth and power leaves him questioning his own existence, searching for meaning in life. Against the better judgment of family and community, Dr. Mully sets out to enrich the fate of orphaned children across the land. Jeopardizing his own life and the security of his family, he risks everything and sets in motion a series of events that is nothing short of astonishing. "I am humbled and grateful, along with my fellow crusaders at FOR GOOD, by the outpouring of support for 'MULLY' all across the USA," states FOR GOOD. Founder Paul Blavin. "We are thrilled to bring the miracle of 'MULLY' back to movie theaters nationwide at 7 p.m. on November 9." Presented as a special one-night encore event by FOR GOOD., in partnership with Fathom Events, audiences will enjoy a special interview with Dr. Charles Mully, captured exclusively for this cinema experience. Focus on the Family is also partnering with Mully Children's Family and FOR GOOD to bring this encore presentation of MULLY to movie screens across the country. A portion of the film's proceeds will go to support orphans internationally through Mully Children's Family and domestically through Focus on the Family. 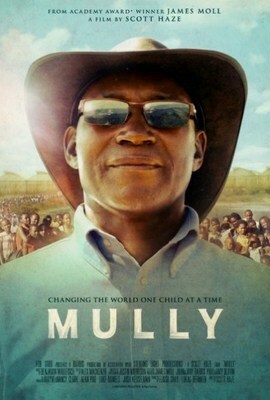 Tickets for the " MULLY" encore can be purchased starting Friday, October 27 online by visiting www.FathomEvents.com or at participating movie theater box offices. Fans throughout the U.S. will be able to enjoy the event in select movie theaters. A list of theater locations will be available starting October 27 on the Fathom Events website (theaters and participants are subject to change). For artwork/photos related to "MULLY," visit the Fathom Events press site. "MULLY" is produced and directed by Scott Haze ("Child of God," "Only the Brave," "Thank You For Your Service"). Executive Producers include Academy Award-winning producer James Moll ("Foo Fighters: Back and Forth" "The Last Days"), John Bardis, and Paul Blavin, alongside producers Lukas Behnken of Sterling Light Productions, and Elissa Shay. Golden Globe and Emmy Award®-nominee Benjamin Wallfisch ("Blade Runner 2049," "12 Years A Slave") composed the feature's powerful musical score. FOR GOOD. is the Emmy-winning, Oscar® and Grammy Award®-nominated production company behind the project. Committed to harnessing the power of exceptional art to inspire hope, compel action and igniting lasting impact, FOR GOOD. is led by Paul Blavin, Executive Producer of the award winning documentary "The Hunting Ground," and the Emmy Award-winning original song "Til It Happens to You," written by Diane Warren and performed by Lady Gaga. FOR GOOD. has partnered with numerous creative talents to bring "MULLY" to audiences in partnership with Fathom, sharing its bold and unwavering vision for a better world. Fathom Events is the leading event cinema distributor with participating theaters in all 100 of the top Designated Market Areas®, and ranks as one of the largest overall distributors of content to movie theaters. Owned by AMC Entertainment Inc. (NYSE: AMC), Cinemark Holdings, Inc. (NYSE: CNK) and Regal Entertainment Group (NYSE: RGC) (known collectively as AC JV, LLC), Fathom Events offers a variety of one-of-a-kind entertainment events in theaters such as live performances of the Metropolitan Opera, top stage productions including Newsies! The Broadway Musical and George Takei's Allegiance, major sporting events such as Mayweather vs. MacGregor, epic concerts with artists like Grateful Dead and Dixie Chicks, the yearlong TCM Big Screen Classics series, inspirational events such as Steve McQueen: American Icon and In Our Hands, and beloved anime titles like Princess Mononoke and Spirited Away. Fathom Events takes audiences behind the scenes for unique extras including audience Q&As, backstage footage and interviews with cast and crew, creating the ultimate VIP experience. Fathom Events' live digital broadcast network ("DBN") is the largest cinema broadcast network in North America, bringing live and pre-recorded events to 897 locations and 1,387 screens in 181 DMAs. For more information, visit www.fathomevents.com.